Olympians know what they're worth. That's why they trademark their names, catchphrases and logos -- things they think might turn into money-making ventures down the line. 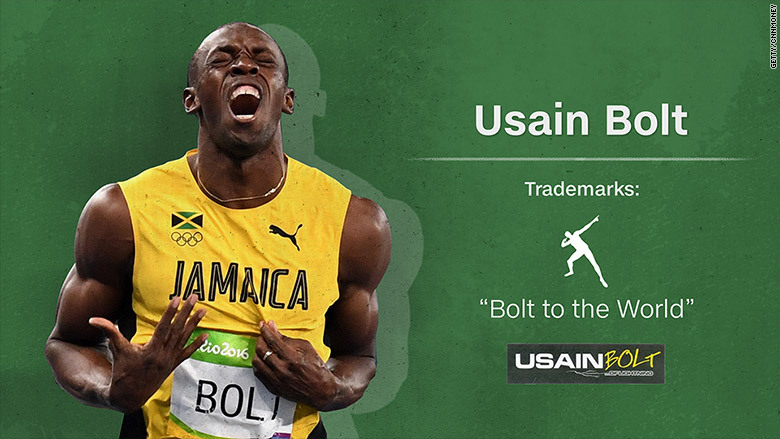 Sprinter Usain Bolt, for instance, trademarked an icon of the "lightening bolt" stance he's so well known for. And it's not just Olympians -- plenty of pro-athletes seek trademarks to make money outside of their playing careers. Bolt, the "World's Fastest Man," won his eighth gold medal Thursday night. And even though he's Jamaican he holds several U.S. trademarks. Many involve his name in various fonts and phrases like "Bolt to the world," in addition to the Bolt icon. Bolt can't trademark the actual physical pose -- only symbols, words, phrases and designs can be trademarked, according to Professor J. Gordon Hylton of the University of Virginia School of Law. Also, applicants must show that their trademark will be used on commercial goods, and it can't go unused for more than three years. 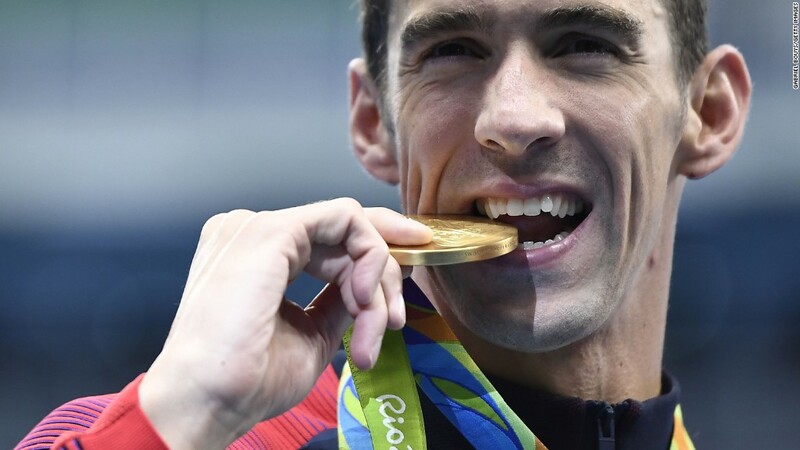 Phelps secured his 23rd gold medal in Rio. He holds the rights to the "MP" logo, which appeared on his swim cap during the Olympics, and the name "Michael Phelps Swim School," which is a chain headquartered in Baltimore. Former NFL defensive end Jared Allen trademarked the logo for his main company, "Jared Allen 69 Inc.," as well as his charity, "Jared Allen's Home 4 Wounded Warriors," which builds handicap accessible homes for military veterans. He also holds the trademark for the phrase "got strange?" 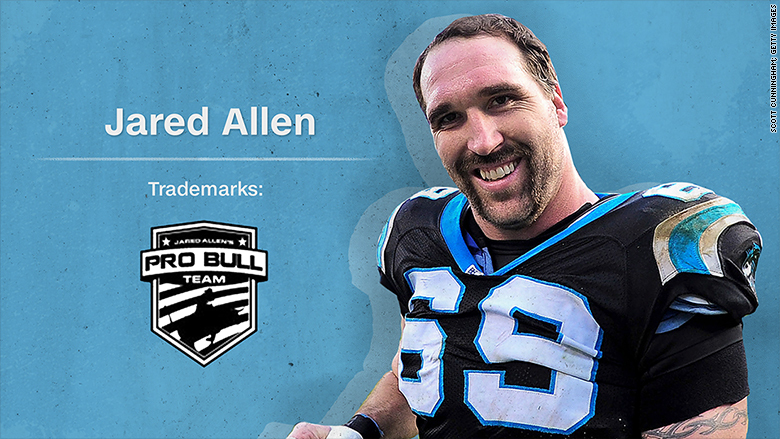 and "Jared Allen's Pro Bull Team," a professional bull-riding team. The "Livestrong" brand is perhaps the most famous trademark on this list. Armstrong founded the cancer charity in 1997 and served as chairman until 2012 when he stepped down amid a doping scandal. 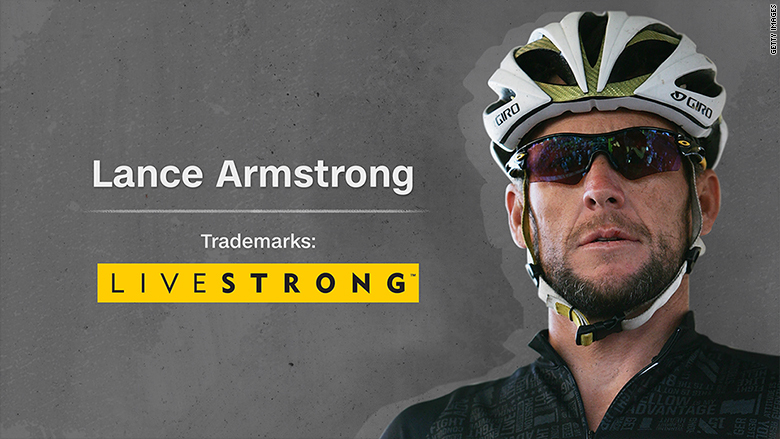 The Lance Armstrong Foundation still holds the right to the "Livestrong" trademark. The NFL quarterback originally trademarked his nickname "RGIII," as well as seven phrases, including "Dream Big Live Bigger," "Unbelievably Believable," "Light You Up," and "No Pressure No Diamonds." He let all of those trademarks lapse except for his nickname and the phrase "Know Your Why," but trademarking things before it's clear they'll catch on is a shrewd move that could end up being lucrative, according to intellectual property lawyer Jaia Thomas. "I recommend filing early just to protect the mark," she said. "Actually I'm surprised more athletes, like Steph Curry for example, don't do it to protect their brand." King James has trademarked a line of basketball-themed furniture under the mark "Home Court by LeBron James." He's also trademarked "The LeBron James Family Foundation" and the phrase "Just a kid from Akron." The NBA player holds multiple trademarks, including "Linsanity." The term, which he filed for in 2012, was the name of the craze that hit when he seemingly came out of nowhere to lead the New York Knicks in a series of wins. O'Neal has trademarks for a wide range of things, including the name "Shaquille O'Neal All Star Comedy Jam," which is for his live, touring comedy show. Shaquille also has "Dunkman" for apparel and accessories, "ShaqFu" for books, soft drinks and video games and "Shaq Attaq" for clothing and footwear. He's even trademarked his signature. 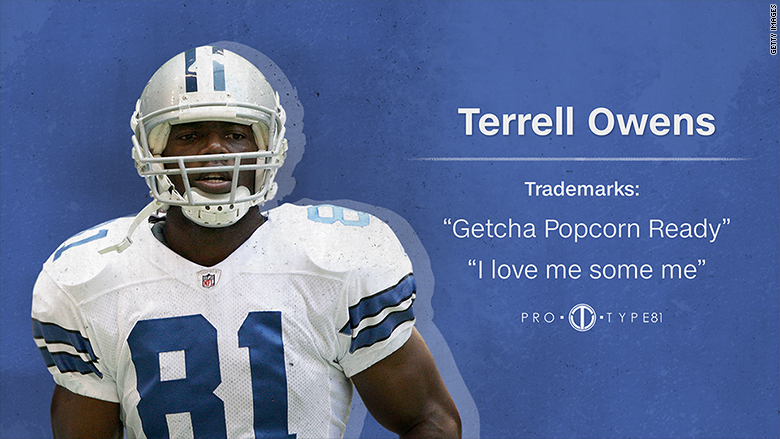 The former Dallas Cowboys wide receiver trademarked the phrase "Getcha Popcorn Ready" in 2007. Owens also holds the rights to the phrase "I Love Me Some Me," and a logo for his line of menswear, "Prototype 81." The logo incorporates a "TO" symbol that he had under trademark until January. 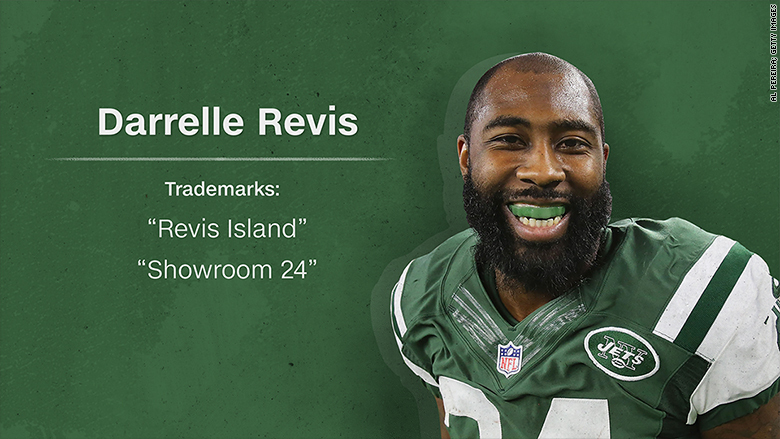 New York Jets cornerback Darrelle Revis trademarked the phrase "Revis Island," which refers to his style of play, and appears on things like swimwear, sleepwear and t-shirts. He's also got an approved trademark application on "Showroom 24," an online retailer that would sell everything from clothing to perfume, but it has yet to be registered. The former NFL quarterback who's now pursuing a possible pro-baseball career, holds the trademark for "Tebowing" through his marketing company, "XV Enterprises." The term refers to the kneeling prayer stance Tebow took before games.